Lots of Vera sightings at the Marine Corps Marathon today!!! My first Large Duffel! I have never purchased a Large Duffel because I already owned an XL Duffel and figured whatever I would put in a Large I could just carry in an XL, but when they were on sale for $32, I just had to pick one up! I decided on Versailles, because I dont have anything in that color yet and I really love the blues in it. One of the neat things about the one that they sent me is that it has almost the same exact pattern placement on each side! I dont think that I have ever seen a large print bag with the same print on each side. You can see what I mean in the photos below. I also purchased a Pleated Tote in Pink Elephants! I only have a Coin Purse and Medium Bow Cosmetic in that print. Here is the top of my duffel! And here is the other! The prints is only a few inches off from the other side. Ebates is currently offering 6% cash back on purchases from verabradley.com. That is double the normal 3%. Just start at Ebates to get your cash back. Click here to sign up! October 27-October 29 receive a free Carry It All Wristlet with any purchase of $75 or more at participating Vera Bradley stores. What a great offer, but I really dont need any new Vera Bradley items for a while. Happy Shopping! 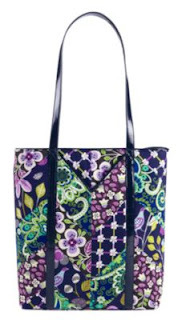 Vera Bradley has posted the Holiday Gifts on their website! They will be available for purchase on November 3. My Vera Bradley package just arrived! I ordered a Large Duffel in Versailles and a Pleated Tote in Pink Elephants last week when Versailles was on sale for 60% off! I was so excited that they arrived today, but when I went downstairs to pick up my box I was not impressed with how the box held up in transit. Some of my friends have had their boxes fall apart in transit, but haven't had too many problems because the last couple of orders came in small boxes. These big boxes seem more flimsy. I think that Vera Bradley needs to purchase better shipping boxes and use a little more tape! This end of the box wasnt taped and since it wasnt taped the box ripped at the corner. Could have used a little more tape! This corner got pretty bumped up, but at least it didnt open up. This corner didnt hold up as well, YIKES! Apparently someone, either at the front desk of my building or maybe at the post office tried to tape this corner shut for me...thanks for trying! You cant really tell in this photo, but the top of the box was all bent it, you can kind of tell by the way the light reflects on the purple. And you can see the corners are pretty banged up. At least what was inside was fine, but if it had to travel any further I dont know if the one side of the box would have held up (at the top of the photo). All of my bags could have just slipped out. But they didnt and now I am the proud owner of a new Large Duffel and Pleated Tote. Come on Vera Bradley, help FedEx handle our bags with care! Wine tasting in Virginia and saw this!!!! Yay! I know I have shared Ebates with you all before, but I thought now might be a good time to bring it up again since we are getting into the holiday shopping season. Ebates will give you cash back for your online orders when you start at Ebates. All you have to do is start your shopping at the Ebates website, then type in the store you want to shop at or browse for a store that sells what you are looking for and then click the "shop now" button. A tracking ticket will be opened and you will receive cash back for your purchase. Another great benefit is that ebates will list any promotions that the store is currently offering. 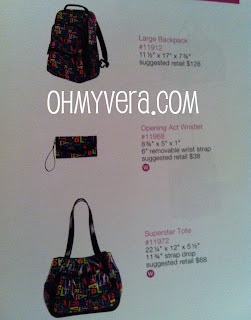 So for Vera Bradley they list the free shipping on orders over $100. 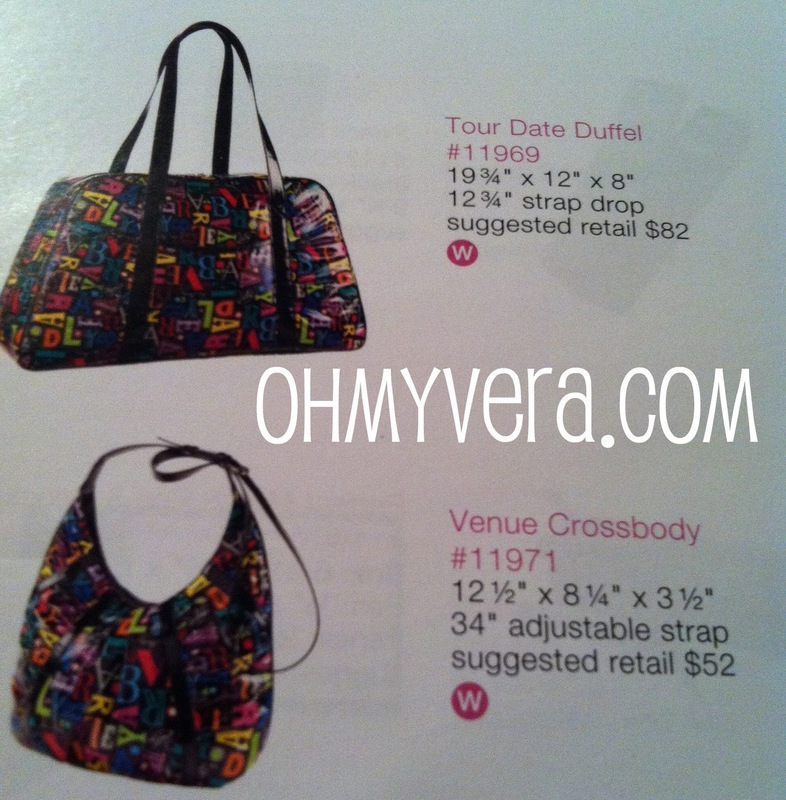 You will get 3% back at Vera Bradley, but sometimes they will run a special and give you double the cash back. Click here to see which stores are offering double cash back in October. They have so many stores listed that I am sure at least one of the stores you shop at will give you cash back. Some of my favorites are Groupon, LL Bean, Kohls, QVC, Snapfish, and Barnes & Noble. They also have travel websites, so check them out if you are going to be doing any travel! 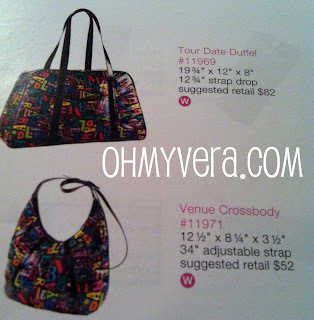 Here are stores on Ebates that sell Vera Bradley: Vera Bradley, Barnes & Noble, QVC & eBags. If there is one I missed, let me know and I will add it to the list. When you sign up they will give you a gift card after you make your first purchase. You can also refer friends to get additional cash back. So click here to sign up and start getting cash back today! 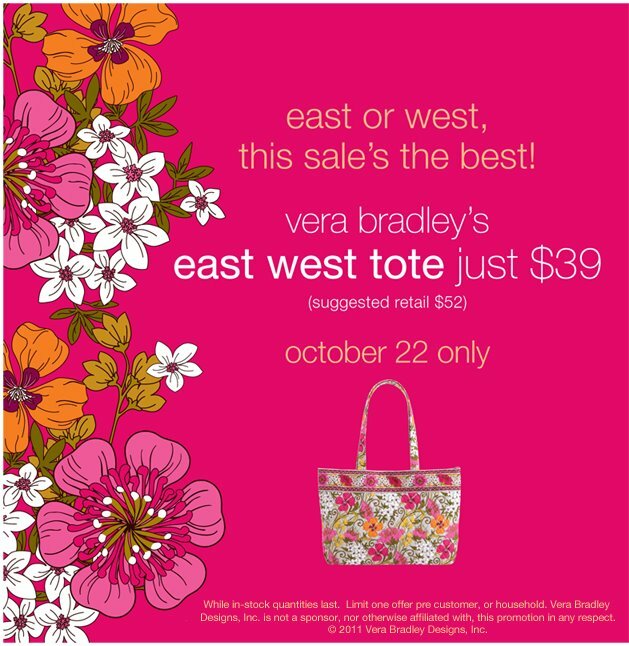 October 20 - 23 Loves Me, Sittin in a Tree, Simply Violet & Imperial Toile are 30% off at the Vera Bradley outlet stores. My laptop just got an upgrade! I decided to pick up a Vera Bradley Under Cover Laptop Skin to protect the top of my laptop. I went with Lemon Parfait because the greys match the silver. I love it! I was a little worried that it might leave sticky stuff when I peel it off, but the woman at the store reassured me that it will come off clean...and when I was putting it on and saw the sticky side my worries went away. Huge two day sale going on at verabradley.com! 60% off Versailles, Imperial Toile & Call Me Coral! I just ordered a Large Duffel in Versailles for $32! I dont know if I have ever seen the price that low before! Sale ends October 20th, but if this is anything like the last 60% off sale items will go fast! 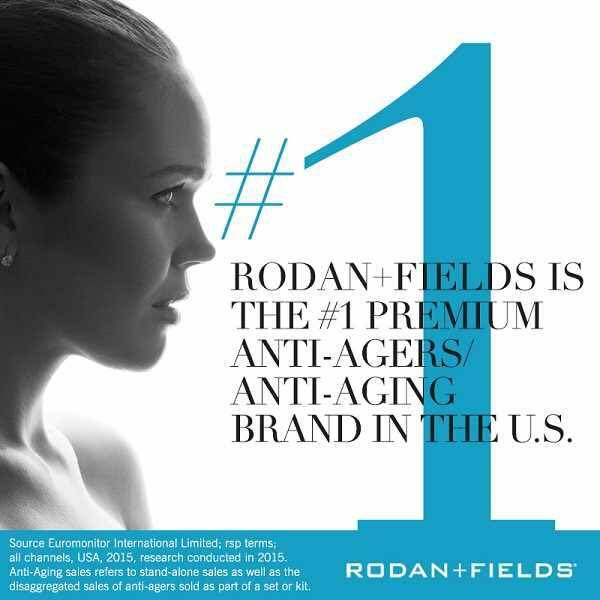 Plus there is free shipping on orders over $100. 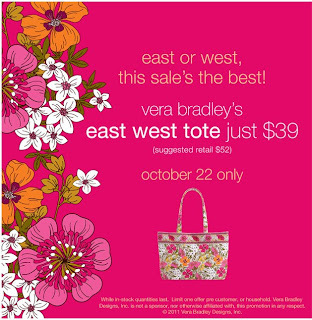 On October 22 you will be able to pick up an East West Tote for just $39 (retail $52). This would be the perfect time to get one if you have been thinking about it. For those of you that own an East West Tote, what do you like about it? 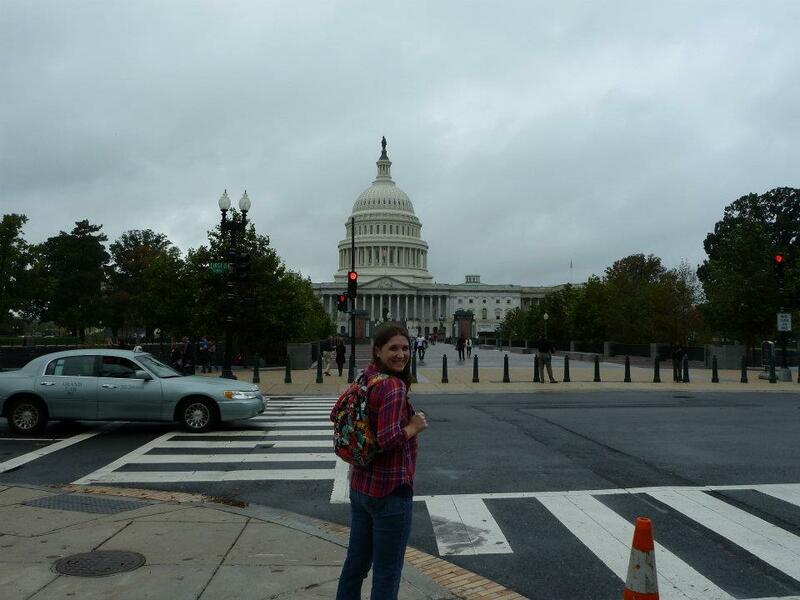 It is starting to cool off here in DC which means that I need to start bracing for my first real winter! My dad always used to joke with me and my sister that we could never live anywhere with real weather...well Erin has made it through her first winter, so I am sure I will be fine too. I already picked up some Sorel snow boots and a nice warm jacket from LL Bean. But what I am most excited about is my new scarf! OhMyVera reader Jessica is making scarves to match all of our favorite Vera Bradley patterns! You can check them out here in her Etsy shop! http://www.etsy.com/shop/jrigsby17 And you can check out her facebook page by clicking here. I picked one up to go with Mocha Rouge! It is so soft, I love it! Here is a picture of my wearing my scarf! I should have grabbed my bag! My friend Amber picked one up to coordinate with Happy Snails! I almost picked up one of the Vera Bradley scarves, but they were a little pricey for what they are. I wish they were a little thicker. So these were the perfect option for me. So warm and soft! I think that you will all really like them! Check them out and let Jessica know you saw them on OhMyVera! 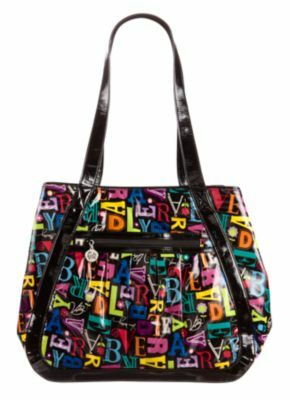 Online at verabradley.com you can save an extra 10% on everything in the sale section! The sale was over the weekend and they have extended it through today. You can also get free shipping on orders over $75. No posts this week, my parents are in town visiting from California, so I will be spending time with them. I hope you all enjoyed your Columbus Day! 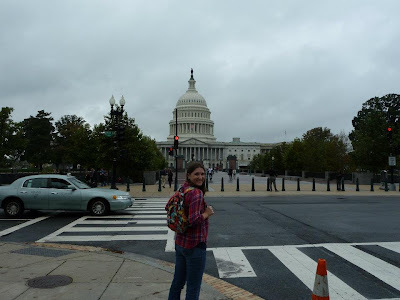 We went and toured Mt Vernon, home of George Washington yesterday! 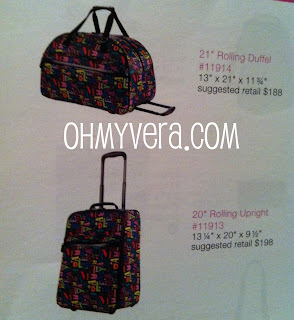 Today Vera Bradley released their newest collections: A to Vera is the new Frill Collection. The other collection that was released today is the Chevron Medley collection which is the new Patchwork collection. This one I am kind of excited about. It combines Floral Nightingale & Rhythm and Blues from Winter 2011 with Plum Petals from Fall 2011. And Suzani from Winter 2011 with Safari Sunset from Fall 2011. I think that they are great color combinations! The Frill bags this season are going to have a new look. 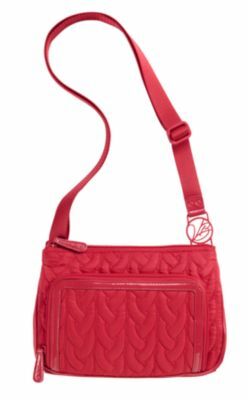 "Vera Bradley" will be printed on the bags in bold colors with a black background. It is kind of a fun look, but I generally dont buy things that have the brand name plastered on the front, so I dont think that these are really my style. I also think that a lot of people are going to miss having Frill be the inside print of the current colors. Are you looking forward to the new Frill collection? Sittin' in a Tree and Poppy Fields are on sale for 60% off for two days! Now through Sunday, October 2nd, online only at verabradley.com. Plus free shipping on orders $75 and over through Oct 16th.